THIS MYSTERY plant has been hanging for at least 15 years from a wooden beam that’s part of the roof of red-clay tile atop the upstairs terraza. I rarely do anything to it. I don’t fertilize it. I often go long spells without watering it. Yet it soldiers on, as they say, sometimes sprouting these lovely flowers. I see this plant daily through the window just above the computer screen that sits on my desk. Alas, the scene isn’t long for this world. Next month, or possibly February, the roof will come down, and so will that brick column you see in the photo. It’s one of two that help support the red-clay roof. The two support columns originally were carved wood, but the bases rotted over time, and were replaced by brick columns. We’ll be installing a huge steel and tempered-glass roof that will cover the entire upstairs terraza. Currently, the tile roof covers 20 percent at best. It was one of the last parts of the Hacienda construction in 2003, and I was weary of spending money. Five months of daily rain and then seven months of direct sun every year have not been kind to the terraza’s ceramic floor. We’ve had it repaired a number of times and just last summer a leak somehow made it through the inches of solid concrete and dripped into the bedroom below. That was the straw on the camel’s sagging back. So a new, far larger roof is on the way. The scene I’ve been admiring through the window above my computer screen for years is going to change drastically, and the fate of this faithful plant has yet to be determined. The oddball, leaning roof is visible over the upstairs terraza in this photo from 2003, just after we had moved into our abode. Putting it there and in that way was entirely my idea. I should not try to be an architect. Next Post Ho, Ho, Ho, Ho! Felipe: We know that plant as a “Christmas Cactus.” It is not a cactus, but I think some kind of succulent, which for most people blooms near Christmas, and goes on sale alongside the Poinsettia, which I grew as an outdoor plant when I was resident in your area. Kris: Well, I’ll be darned. And that would explain its blooming right now. Thanks. I have no idea what that plant is. 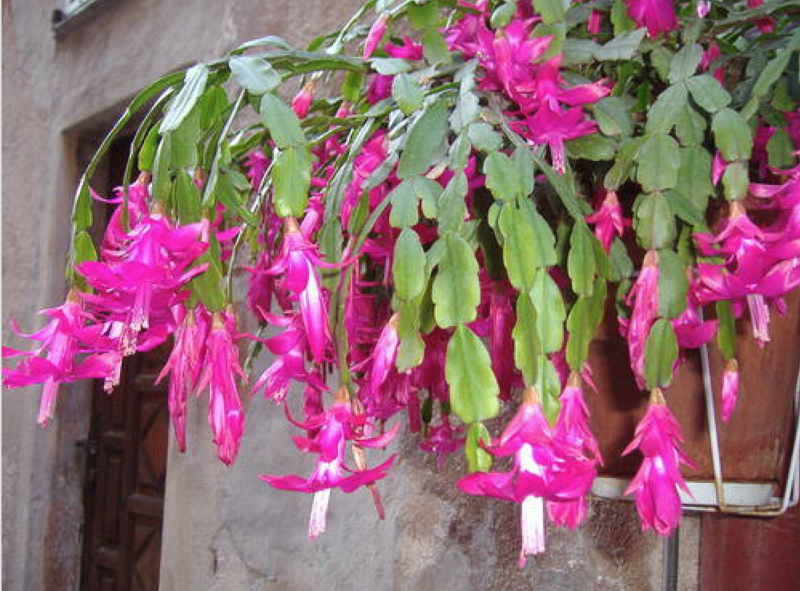 Up here in Tejas we have a Christmas cactus which is actually tasajillo, also known as Christmas Chollo. A nasty little bugger if ever there was one. Nice little fruit around Christmas time each year, which is edible. In South Texas and parts of Southwest Texas these things intermingle with prickly pear, mesquite brush and any other plant life available and can create an impassable landscape. You just have not lived the vaquero life until a horse throws you in one of the messes. Ricardo: So you’ve had a horse throw you into one of those messes? I hope not. In my vaquero days, I slid through a couple of these and other cactus wrecks. Likely explains why I worked so hard to have another profession. That was in another century and just a memory now. I was just going to say Christmas cactus, too. The lookalike Easter cactus blooms in the spring, closer to Easter. Hopefully, it will find a new home at your hacienda. Thanks, Perry. And I think it was the link that made your comment go to the moderation line. Perry P.S. : That’s not just a lookalike plant. It’s the same thing, and since mine does not just bloom around Christmas, so … Easter too. Catholic plant for a Catholic country. I think if you gave yours a bit more love that it would reward you handsomely. Kim: Now that I know it’s name I’ll pay it more mind. I promise! Your readers have a sharp eye for plants. I did not recognize that Christmas Cactus, although I sat next to one in full bloom today at a family gathering. I believe folks around these parts bring the basket inside in the winter, or at least put it under some kind of shelter. Try to save this one if you can. Fifteen years is pretty good run for a potted plant. Keep yours. Their survivor instinct is an example for us to follow. Steve: Forty years old?! Wow! So this thing could outlive me. Interesting. Jode: Yep, that’s what it is. Seems everybody knew that but me. And it is a very hardy bugger! Feliz navidad! I know you’ve already rejected this idea, and are a few keystrokes away from rejecting it again. But I’m still voting for a palapa to replace your roof. However, we are in total agreement on the aesthetics of the old roof. Whatever you install, I sincerely hope it fits nicely on your otherwise lovely house. Where we know an architect or two. Kim: Palapas are for beaches. We ain’t got no beach. And it would require maintenance. Nope, we’re going with glass and steel. It will look swell.